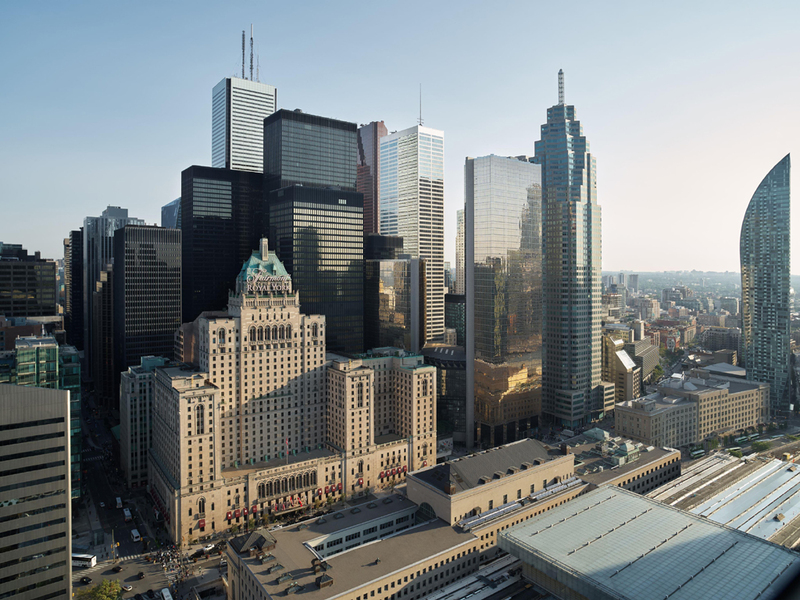 Fairmont Royal York is located in the heart of Downtown Toronto, and is just steps from the city's biggest sites and attractions including: The CN Tower, Ripley's Aquarium of Canada, Rogers Centre, the Eaton Centre, Scotiabank Arena and the Sony Centre for the Performing Arts. We invite you to indulge in the culinary creations of our Executive Chef's award-winning culinary team. Choose from five dining establishments with seasonal herbs from our rooftop garden and honeybee apiary brightening each dish. Whether you're in Toronto for a meeting or to relax and take in the sights, this landmark hotel has everything you need. Luxurious surroundings, refined Toronto accommodations, with knowledgeable Concierge, Business Center, Health Club and Indoor Pool. Each guest room offers modern comfort, in a historic, downtown Toronto luxury hotel. Library Bar is the ideal venue for pre-dinner or theatre drinks, business lunches or evening cocktails. Traditional Afternoon Tea is served on Saturdays and Sundays. A la carte breakfast is served daily from 7 a.m. to 10:15 a.m. Enjoy the excitement of Japanese teppan-cooking right at your table! Expertly crafted sushi and sashimi and premium sake are also available in the Lounge. Join us on our coast-to-coast journey of casual favorites with a uniquely local twist. Canada's best food and famous beers are within easy reach. We invite you to try classic pub fare made with Canadian East Coast seafood, Ontario beef and Quebec cheeses. Fresh coffee, house-made muffins, sandwiches, salads and daily specials to get your day going. York's Café is open daily from 6:30 a.m. until noon. Room was good, valet service was excellent. Directions to check in counter were horrible. Gentlemen who finally helped us, was short, not overly pleasant and not offering information freely. Had to ask how to get to the room. The Fairmont Toronto was a delightful stay. Personal highlights that make this hotel stand out are the water kettle and good quality tea (4 kinds!) in the room plus the excellent fitness room and pool area. The windowed walls and ceiling in the fitness room and pool make it such a delightful experience. Plus - bathrobes in the locker rooms adjacent to the fitness room make it so much easier to get up to your room after swimming/hot tub. The walls may be a bit thin. It wasn't an issue until my final night when the hotel must have been busier, and the guests in an adjacent room decided to be up talking loudly until 3am, waking me up. It wasn't a party, just a bunch of people talking in the room, but since it was so late I called guest services, they sent up security, and the issue was resolved quite quickly and politely. I truly enjoyed my stay at the Fairmont and would definitely want to stay on another occasion when I can visit Canada for leisure. Everyone was very friendly and extremely and most importantly patient. I felt comfortable, safe and relaxed in a lovely environment. My room was so luxurious and I loved the bathroom layout. I enjoyed a glass of wine on the 18th floor in front of the fireplace....just what I needed after a stressful week. I would definitely book this hotel again. Personal room was great. Meeting table was crowded for 12. No napkins in room. Everything was fine - room was clean and pleasant, although some features were not working completely. As the above sentence described, everything was okay, but the shower was frustrating as I could never get the water to come out of the shower head 100%. There was always a significant amount coming out of the hand held shower head. Furthermore, the drain was not working properly in the shower. Finally, I could not get the TV to work. I didn't realize this until late in my stay, and I couldn't be bothered to call someone to help. 70 min wait for room service - ridiculous! You know the business you have and should be staffed properly. Not to mention the price of dinner - certainly willing to pay for a delicious meal but it wasn't. Initially given the room next to the elevator shaft. How can anyone -with hearing intact - sleep in that room. Front desk found another room for me and that was handled well, with bellman bringing me the new key. A wonderful experience....so many small niceties that added up to a great get away. One doesn't mind the price when the expectations are not only met, but far surpassed. Well done! Under construction and challenging to navigate, sprinkled with bad restaurant service/manager response. Small uncomfortable room and noisy from the street. Old shower system. The hotel is beautiful inside and out. The staff was courteous and kind, both to guests and conference-goers. The room I was given was beside the storage unit for the hotel. There was a lot of noise throughout the night and especially during the day. The weights of the elevators produce an echoing noise and resonates terribly in the room. Although, changing rooms was not immediate when requested. I had to call twice and speak with the manager on duty. I believe it could have been resolved with 1 call instead. Hi, I like my stay as usual at your hotel and unfortunately , not sure why, my room wasn’t done last Wednesday. I made sure that the privacy sign wasn’t on the door. Everything else was perfect.